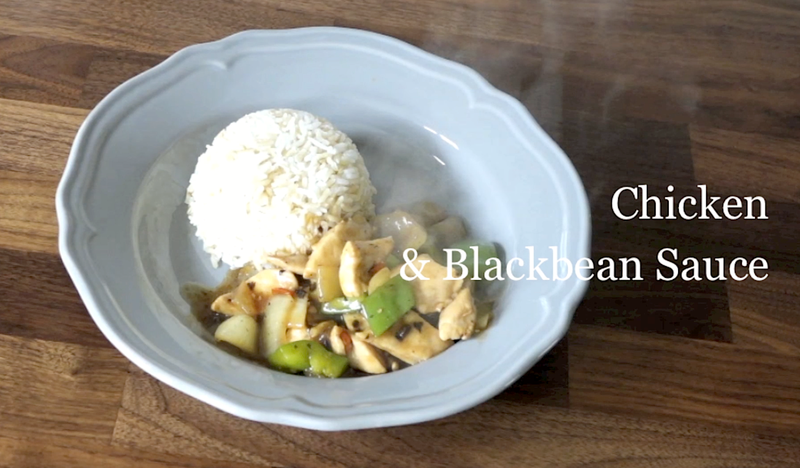 Chicken In Blackbean Sauce | YouTube Cooking Video No 2! I'm back with a second video on YouTube! This video was actually filmed last year, but somehow I never got round to publishing it. I'm so glad it's finally up as this is one of my absolute favourite Chinese dishes. Hanh from Hanabelle is the lovely film maker and editor behind the camera, and I can't thank her enough. Make sure you guys head over to her beautiful blog and check out her own lifestyle videos too. They are all inspiring and so much fun to watch. Cooking a different meal daily that doesn't take up loads of time or become repetitive isn't difficult and the aim of all my videos is to show you how to cook the meals in under 30 minutes that can feed up to 4 people. If there's only 1 or 2 of you living at home, this means more food leftover for work lunches and homemade fast food dinners. Blackbean sauce is a classic Cantonese flavour, and if it's done right it will leave you wanting more. From chicken to beef to clams, blackbean works well with almost everything. In the UK, blackbean sauce is easy to buy in the supermarkets and comes in a jar, but I want to take the opportunity to say this is not the authentic way to make blackbean dishes! A blackbean dish requires the real fermented black beans, which can be picked up in Chinese supermarkets and the recipe I am sharing today is an adaption of my dad’s blackbean dish which taste out of this world. 9. Spoon in the soya and oyster sauce mix and add ½ cup of water. Add ½ tsp dark soya sauce to add colour. Simmer for 5 minutes until the chicken is cooked through. Ooh, check you out on Youtube! I don't actually eat chicken (vegetarian) but I'm tempted to try this recipe using Quorn pieces, I think it should work just as well! I'm naughty and have always bought black bean in a jar (cringe...) Sorry. Hehehe *shy face*! I wanted to make videos so ppl can see how easy it is to cook some of these traditional Chinese dishes. Ah yes, Quorn will work, and aubergines in blackbean is pretty tasty too!